Meet up noon to 1pm, Saturday 12th Nov 2016, Stroud High Street, outside the old Millets shop. Everyone welcome, bring a sandwich. Probably a good idea to bring an umbrella too, as light rain is forecast. And so that we can be an anti-Trump umbrella group. Words can hardly express how depressing and worrying it is that President Trump has been elected today. It feels like Brexit morning all over again, but with terrible implications for the whole world rather than just for the UK. If there’s one thing that’s an antidote to all that Trump stands for, it’s Permaculture. I think the message from this year is that people of goodwill and good sense need to work together for the sake of a saner, safer future. I’m promising myself that I’ll be less complacent and more active. Whilst making my own little patch into a bit of eco friendly heaven, I mustn’t stand by and let the whole world slip into hell. Any ideas for acts of collective solidarity most welcome. We’re a group full of great people who live by the permaculture principles of earth care, people care, fair shares… but we don’t have a great history recently (in Stroud) of doing stuff together or publicising what permaculture stands for. We have a banner (literally and metaphorically), I think we’d better get it out there in the public more often. If you’re reading this and are not a member of your local Permaculture group, I’d say that now is the time to join. 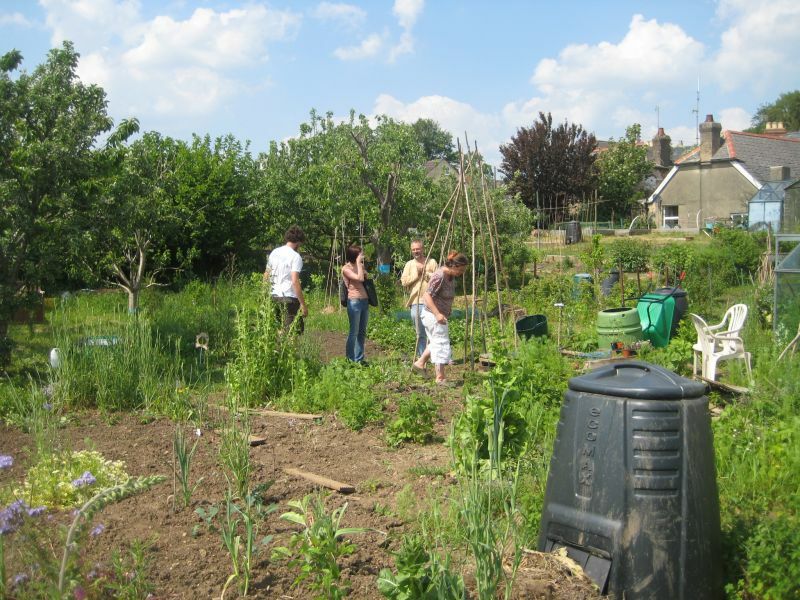 If you live somewhere that doesn’t have a Permaculture group, start one! If you want advice on how to do that, any permaculture group, including ours, would be happy to help. This is a World Emergency. 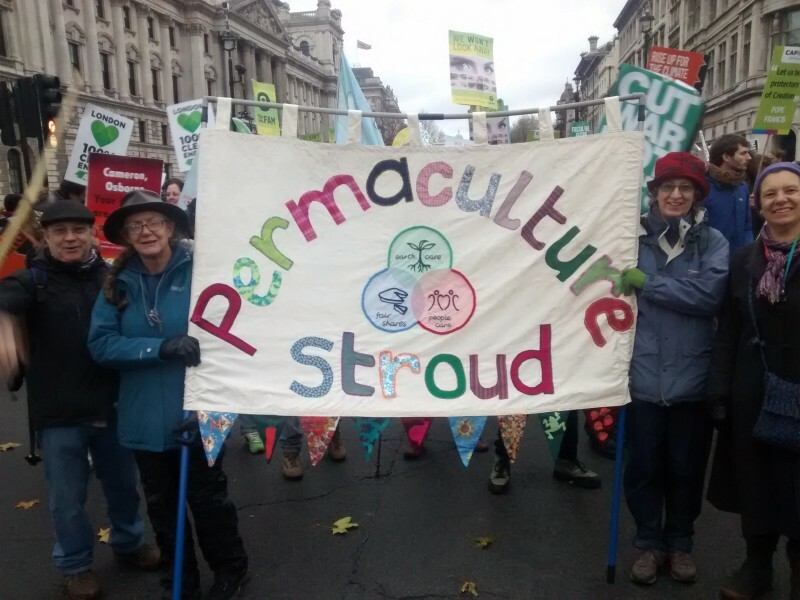 Stroud Permaculture Group members took part in the Climate Change march in London on 29 November 2015 – with the lovely banner that we made last autumn for exactly this sort of occasion. There were approximately 50,000 people on the march, calling for governments to agree significant action on C02 emissions at the COP21 UN Climate Talks which start in Paris this week. The course takes place over 12 Thursday evenings plus weekend field trips and practical days. 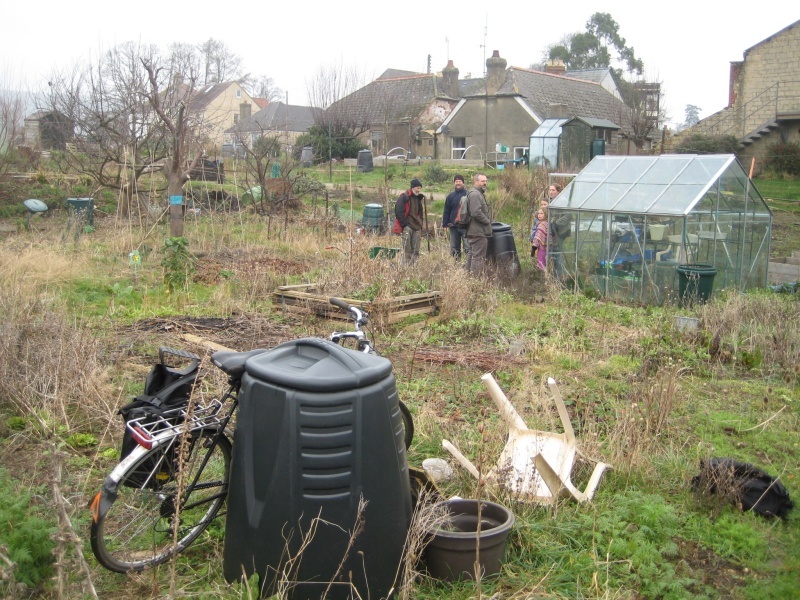 Organised by Transition Stroud and Stroud Permaculture Group. Cost £325 full, £225 low wage or £115 unwaged. Places are limited and will be on a first confirmed basis. To ensure your place please send in a booking form with a deposit cheque asap. As a trial we shared some nine star perennial broccoli seedlings last year. After all, if it’s really perennial and really broccoli, that would be great! Here are our results from year 1. Though not huge, my three plants have been looking v. healthy and growing well all winter. The largest is getting on for 3 feet, but the other two are smaller. Like you a couple of days ago I was poking around the foliage and there were loads of little white sprouting broccoli’s. Actually the biggest plant has a relatively large central head 2 -3 inches and several smaller side florets. The next largest has a small central floret but loads of small sprouts all around the stem, and the smallest of the three is not showing any sign of flowering at all yet. I had a taste straight off the plant and they where good. 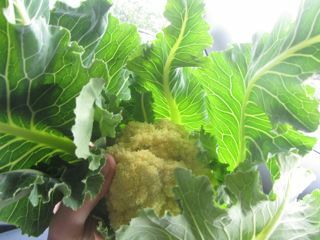 To me the taste was a bit like a cross between cauliflower and broccoli. 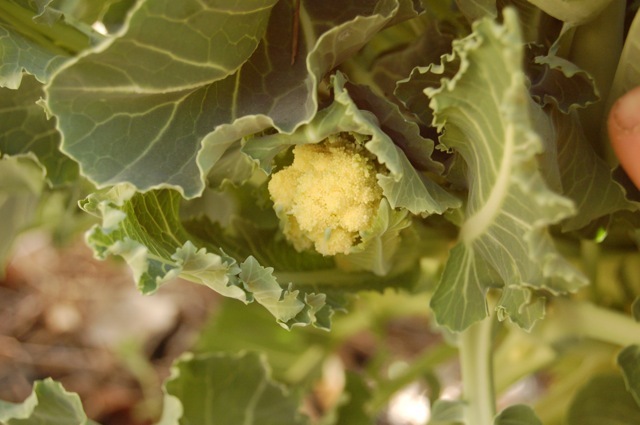 My plants produced similar white florets, and the taste was not quite cauliflower, not quite broccoli. Stronger flavoured than cauliflower I’d say. Pleasant though and no doubt full of goodness. My plants were fairly small, maybe 18 inches to 2 foot tall, compared with purple sprouting broccoli plants of the same age which were 3 to 4 feet tall. It will be interesting to see what the plants and florets are like in years 2, 3, 4 etc – will report again here next year. So far I’d rename this plant ‘hopefully perennial sort of strong-flavoured small cauliflower’. The idea behind having use of this plot on the Cainscross Allotment site is to have a base. Somewhere to observe, somewhere to learn from, perhaps design planting ideas. There’s a greenhouse to use, some tools and a compost bin. Among those that came along on Sunday we had a couple of tours of the plot looking for plants emerging and thriving, e.g. herbs like rosemary, sage, marjoram, thyme, mint, parsley and sorrel. Seb and I found some decent garlic emerging and a suggestion was that sometime during the year we could create a meal out of what was growing on the plot. There are fruit plants including summer and autumn raspberries, rhubarb, two small apple trees, grape vine and strawberries. Thanks to the girls for cutting back the raspberries. The plot is also covered with flower plants, including some green manures like phacelia, lots of chard, hollyhock, poached egg (Limnanthes Douglassii), Jerusalem artichoke, artichoke, heliopsis helianthoides, sweet Sicily and comfrey. Also some Lacinato and giant walking stick cabbage. Many thanks to all those who came along and so sorry if you missed us. By about 1.30 it was getting too cold, especially for the children so we toured the allotment site a little looking briefly at my plot at the top. We then migrated to my kitchen for tea, and some food that people had made. This was a worthwhile event. We also broached the subject of undertaking Permaculture courses. There seem to be emerging plans on this. Ideas came out about using the plot for design experiments, and it might feature in the up and coming Spring Gardening Event for Sunday 15th April. We have several nuclear power stations near us on the Severn, and evil EDF is trying to build a new one, Hinkley C. I plan to join a 24 hour blockade protest there in March on the anniversary of the Fukoshima disaster. Usually I base my objection to nuclear power on the terrifying danger of nuclear accidents, but let’s not forget the ludicrous financial cost of nuclear. If I told you that 55% of the department of Energy’s entire budget this year is going on decommisioning and cleaning up old nuclear power stations, you’d think I was making it up, but sadly no. Next year, it will be two thirds of the department of energy’s budget. Private companies develop nuclear power, and the govt is left with the bill for cleaning up. And some people try to tell us that renewable energy is uneconomic because green energy is currently helped by a small levy on brown energy. The link below is to Hansard where Chris Hughne gives the figures above. Home grown olives and mushrooms – hopefully. Having sort of finished a stressful project yesterday I was in an indulgent mood. My ramblings, as they often do, took me into Wilkinsons (the shop in the Merrywalks centre). They have lots of exciting and cheap plants in. I KNOW that cheap plants, like everything else, usually means that the environment or even human rights are being trashed somewhere, and in this case I guess the source will be polluting heated dutch greenhouses. Caveat emptor. However, they have lots of fruit bushes in little boxes for about £2, and TREES in little boxes for about £4. As they have only recently arrived in the shop the new season bushes and trees (and onion sets, shallots, potatoes, asparagus roots etc) are in OK condition and not yet dead, which does tend to happen to plants in such shops. So I bought myself an olive tree (I’d yearned for one for ages) and a lemon tree. I also bought a packet of mushroom spore from the seed department – I don’t recall having seen that for sale before in a shop, and had been meaning for years to have a go at mushroom cultivation. Just thought I’d share this in case anyone else is a sucker for bushes and trees in little boxes (it sort of feels like ‘saving’ them when you give them a home). Incidentally, my fruit bushes normally come from my own cuttings, and if anyone has patience I’m glad to take some for you in the autumn. Does anyone have any experience with growing olive trees or lemon trees? Obviously I’m planning to pot them up and keep them in a sheltered place, but I would SO love one day to be able to pick some home grown olives or lemons. And any hints or experience with mushroom cultivation? – Peter (maybe members would like to blog on this site about their permaculture activities? If so, just contact me and I’ll set you up with a username for the site).